The molar volume is equal to the atomic weight divided by the density. Image showing periodicity of molar volume for 5s and 5p chemical elements. The molar volume is also known as the atomic volume. 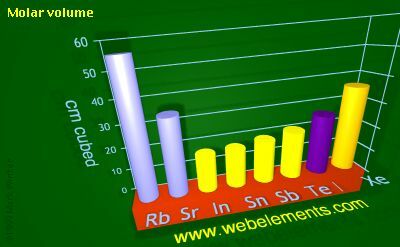 The standard SI units are m3. Normally, however, molar volume is expressed in units of cm3. To convert quoted values to m3, divide by 1000000. The molar volume depends upon density, phase, allotrope, and temperature. Values here are given, where possible, for the solid at 298 K.
C.N. Singman, J. Chem. Ed., 1984, 61, 137.